Any of you guys got this combo with the 12" Cannabis Rex speaker. I presume there is no PCB in sight? I've got one of these on the way to me this week, not many at all around here so pulled the trigger on our local auction site a few days ago. These are held in high regard on the MLP. Looks like Fender stuck with the 22uF in the first filter stage. Very common for techs to bump it up to 40uF when replacing the cap can on the old ones. The bias pot is a nice touch. What effect does the use of a 40uf cap have. Mostly tightens up bass response and also buys a couple watts of headroom. It's a balancing act. The cool and funky vibe of a Princeton Reverb is partly due to what some consider the amps "deficiencies." Every little mod that is designed to address these quirks inevitably takes away a little bit from the uniqueness of the amp. If you go too far one way toward making the amp band friendly you lose what makes a PR such a fun amp to play and record. At that point you might as well go and get a Deluxe Reverb. The bump to 40uF in the filtering has proven to be stable in the PR, especially with a GZ34 rectifier. Those little weeny power transformers also appear to be able to handle it. It's not going to be as dramatic a shift as going to a loud and efficient 12" speaker, but it does help to clean up a little of the bass frequencies without sacrificing too much of the PR flavor. Yes I've watched a few vids with 10" speaker PRs and have not been impressed with the flabbiness at higher volume. Play the amp for a bit before you think about switching it out. The speaker might be enough. I favour alnicos so we will see how it all goes, will also try the G12H30 and G12M20 plus an old 74 1772 alnico I acquired recently, it's a 12w but works okay in my '74X so far. This amp is interesting in that it suits teles and strats more so than LPs and other humbucker guitars. Tried both a Blue and Gold in it with the same results........the LPs(hummers and P90s) fart it out at higher volume(above 5 and LP dimed) whereas the tele is a lot more controlable in that regard with a better overall response. Took it to my amp guru and he tested it out with these results. It easily accomodates 16 ohm speakers and is geared more for that ohm load, it has Heyboar trannies and has a maximum output volume of 22 watts. He also said that the IC caps will leak after a few years(from what he's seen) and he suggested replacing them with Furman(F&T). Compared to my 1974X combo this amp is not as flexible for a good sound.........the '74X can handle the dimed volume levels with a Blue or Gold or any other quality speaker.... and the PR can't. I'm no amp tech expert like sonar and others on here, but having played my SR for decades and this PR recently I'd have to say that the LP/Marshall combination is a much better setup. However, I'm wondering if a Deluxe Reverb also goes flabby when pushed as I've not had the opportunity to play one as yet. Last edited by goldtop0; 04-12-19 at 11:36 PM. Some pretty great recordings have been done with PR's and humbuckers. Larry Carlton on those Joni Mitchell records are good examples. Fwiw I'm pretty much a pickup agnostic with the PR - anything from Filtertron or Dearmond Gretsch, Tele to Strat and LP with PAF style humbuckers. I would say (imo of course) the PR is a little more forgiving than a 5E3 with 'buckers. In general bass response is a little loose on the smaller BF amps, from Champs up to and including the Pro/Vibrolux/Vibroverb amps. It's not particularly difficult to adapt your playing, but you do need a slightly different approach if you're used to big iron or even a smaller British voiced amp. Making it a little more weird is the PR. With a cathodyne phase inverter and undersized transformers matched with nfb and tone stack of a BF amp, the recipe can amplify (no pun intended) the audio profile. Ratty and buzzy to some, grindy and bouncy to others... all with scooped mids. It's the uniqueness that many find endearing, others annoying. For eq I like to run PR's with bass at 3 and treble at 9. Volume around 8 to 9 with the band and only sparingly using an EP-Booster for 1 or 2 things. Dirt is more or less all amp. Another recent project I've been turning down, around 3 to 5 for a cleaner tone. I use a 12" Red Fang in my PR (I don't want to blow up my Blue) which is an alnico British voiced speaker. And PR's like a hot bias. You lose some of the Tremolo effect, but it really livens up the amp. I built my clone with some different specs, but the overall feel and tone of the PR are basically there. Getting my head and playing around this PR now, it's good up to 7/8 on volume(LP dimed) above that I have to be really careful with low E and A playing as it flabs out. Will leave the Gold in it for the time being. Keep us updated. Hopefully the amp will eventually sit well with your ear and technique. There are some things to clean up the low end a little bit while buying a few watts of headroom, but you should like the base tone of the amp before digging into these tweaks. Depending on how hard the amp was played before you bought it fresh power tubes and a bias might help. The previous owner had it for a year and didn't play it hard........was 'as new' when I got it recently. Have had it to Clarry my amp guru and he checked it out with a fine tooth comb as previously posted, so all good, and it's just a matter of me finding the sweet spots with my LPs. Will discuss the 'hot bias' thing with him though, thanks. Talked with him about the 40uF cap option and he basically gave me word for word your description of that re it possibly taking away a bit of the PR character. Last edited by goldtop0; 04-18-19 at 04:59 PM. The 40uF in the first stage does take away a little of the PR funk, but it helps tighten up the bass. The originals ran a 20/20/20 cap can configuration and many techs recommend bumping the first stage in the can to a 40/20/20 when people go in to replace the electrolytic caps. Weighing my options I went 40uF in my clone and don't regret it. Hot bias isn't anything over the top, basically 70% dissipation. Some players (and Fender factory) like it slightly colder, around 60-65%. If your tech is willing he can adjust bias while you play to dial in what you like best. With this PR I get to use the tone controls on my LPs more and also on the amp(compared to the 1974X).........gradually getting used to its nuances.......it's beginning to sound really good. Once you get used to it, PR’s are a blast to play. After all this time I still get such satisfaction with the fun factor of a cranked up PR. For printed circuit board PR amps, I swapped out the stock output transformer to a Heyboer/Allen Amplification T020 upgrade (BillM mod). This change preserves the PR tone but gets rid of low end flabby/woof distortion. The swap is very simple and fits existing mounting holes. Is this an upgrade from the existing Heyboer trannie that is in my one, do you know ? It's essentially a low profile Deluxe OT. Also made by Heyboer, designed by Dave Allen and BillM. More iron, more mass and turn ratios gives a core size that provides a higher damping factor. Basically helps with (you guessed it) low frequencies. Notice the trend with PR mods? It's not a new idea for a modification. 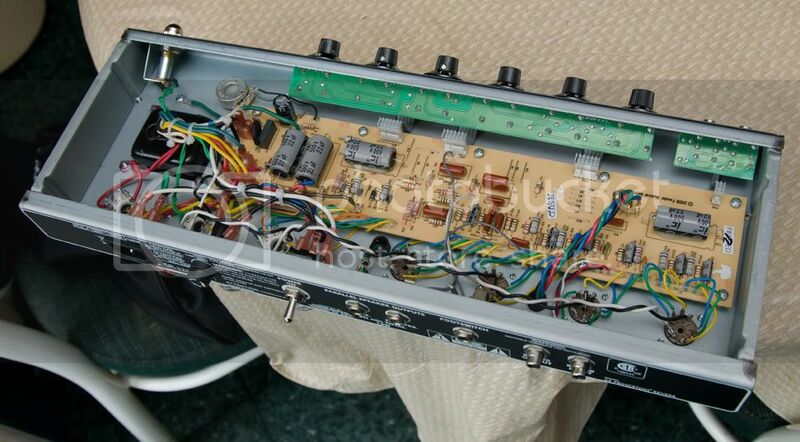 For whatever reason(s) the original PR chassis had holes punched out for a Deluxe output transformer mount. Players for the past 50+ years have been swapping out for a Deluxe Transformer and 12" speaker, transforming the PR from a 12 watt student amp into a portable club amp. Randall Smith would take this idea much further developing the Mesa Boogie Mark I using the PR chassis and cabinet, but that's another thread. I agree that the general flavor of a PR is still there with a bigger output transformer, but you do lose some PR funk. The amp will grind a little less, sacrificing some of the fun factor. BillM (RIP) described the overdrive characteristic of the original PR transformer as a "blat." That's pretty much gone. Again a trade-off. Do you want a classic PR with all the strange characteristics that make it such a unique Blackface amp, or do you want an amp that is slightly less funky, yet enough amp to use with a drummer? Fwiw I built my clone to be a band amp and went with the TO20. You buy a few more useable watts, more than bumping up the first filter stage. Yes the trend is very evident isn't it. I don't need the extra grunt in terms of output and am happy with the PR as I'm getting more used to it. Good to know that these things can be done however, helpful information. This amp has a good deal of volume. Interesting that you should mention Randall Smith.........I sold a lot of Mesas in the '90s when working in a music equipment import business.